Lars Petter Nordhaug, Alex Peters and Kanstanstsin Siutsou all crashed out of the Tour of Denmark on Thursday, on a day that Team Sky will probably wish to forget. Team leader Nordhaug and new recruit Peters were brought down in the same crash on stage three, which also saw number of other riders hit the deck. According to the team, both riders struck road furniture on their way down and were taken to hospital for X-rays. Thankfully, examinations confirmed that neither sustained any fractures. The most spectacular crash befell Siutsou, who was part of a three-rider move at the front of the race. Riding between farm buildings, Siutsou crashed heavily as the tarmac road changed to a short section of dusty cobbles. 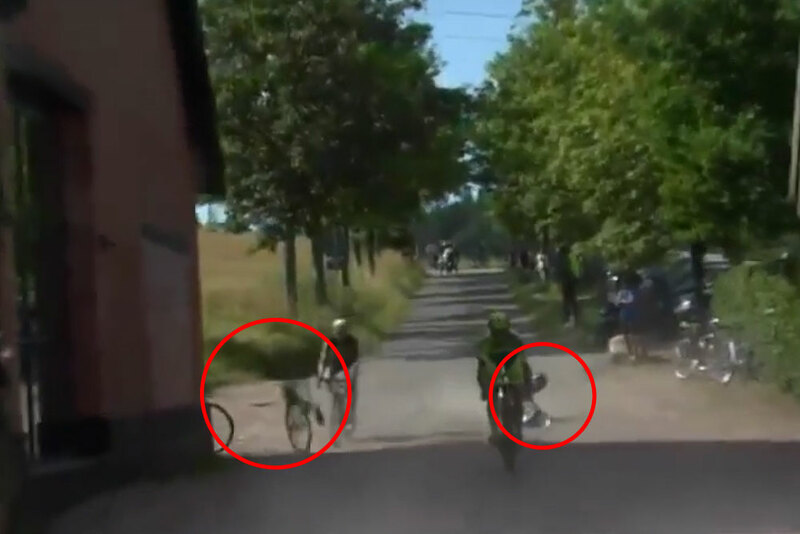 The Belarusian was sent tumbling to the ground one way as his bike cartwheeled at some speed into the side of one of the farm buildings, nearly hitting another rider. Amazingly, given the speed at which he crashed, Siutsou also avoided serious injury. Five of the original eight Sky riders are left in the race: Ben Swift, Nathan Earle, Sebastian Henao, Chris Sutton and Christian Knees. “The guys are banged up. They weren’t able to continue after the crashes and went to hospital,” said Sky sports director Kurt Asle Arvesen. With no radio communication available during the UCI 2.HC-ranked race, the Sky riders further back were unaware of Siutsou’s fall and held back, scuppering the squad’s chance of a top placing. “When three guys who we’d hoped to be there in the final crashed there’s not much you can do,” said Arvesen. Matti Breschel (Tinkoff-Saxo) went on to win the stage, with Lars Bak (Lotto-Soudal) assuming the overall race lead.